SpongeBob SquarePants is the eponymous character of the Nickelodeon animated series SpongeBob SquarePants. He was designed by marine biologist and animator Stephen Hillenburg, and is voiced by Tom Kenny. Stephen Hillenburg intended to create a series about an over-optimistic sponge that annoys other characters. 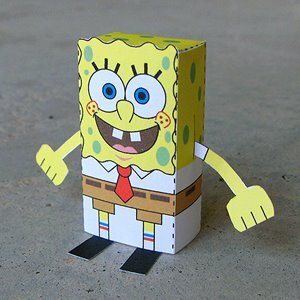 Your Spongebob looks just like him, it is almost hard to believe that he was hand drawn. Looks great, keep up the good work! This is not hand drawn. However, I would love to do some hand drawn toys one of these days! Awesome Stuff Joe, I look forward to the new character every morning. Any plans for maybe some X-Men, or Pro Athletes? Yes, chances are I'll come to them at some point! so cool! that will look great as a party favor and match the spongebob cake I am making for my kids birthday. Thanks, your a champ!